Everybody dreams of becoming something great. Finding out what that means exactly is the real question, the personal journey all must undertake. Will you be kind? Will you be strong? Generous? Selfish? All or none? It’s up to you to see through the eyes of a cute little blob and shape them as they live out their days in a world where sometimes somebody needs to take a stand. Will you be the one to do it? Is there any other choice? Your story begins before the beginning. Not even alive, your mind begins to form, curious at the life that will soon bloom before you. How will you live? What choices will you make? Will they be the right ones? Once you finally open your eye for the first time, you are greeted with the majesty of your world…a slime pit. As a fresh born Morsel, you and all others like you like within the confines of a vat. Small in reality but, for now, it is your world and it is in here that you begin to shape yourself both physically and mentally. Your first trial comes in the form of a fellow monster, albeit an angry and violent one. Faced with an imposing threat, at least to a youngling, it is up to you to decide how to handle it. Will you lash out in anger? Or will you use your forming brain to unite those around you in resistance? I don’t know, it’s up to you. Were you expecting an answer? It’s an interactive story, come on. Regardless of your choice there is one thing you cannot change: time. In what seems like the blink of an eye, it’s time for you to move on from the vat and become a Monsterling. It is now up to you to explore the world and decide your actions. Save an injured companion, destroy those who oppose you and build your skills accordingly. Continue to live throughout the life of Monster and shape his destiny. Will you perish an Adult or gain the respect to become an Elder? Only time will tell and actions speak louder than words. Monster Loves You! is an interactive story. Each line of dialogue is ended with a branching path system for you to navigate. Exploration of these will net you different scenarios and alter the course of the game. That being said, you only get one chance to decide, after which you will be forced to live with your decision. Depending on your choices, you will improve your personality in different ways. Choosing the bold move will net you more bravery, compassion will bolster your kindness and attacking all who oppose you will grant you increased ferocity. Certain options, especially those late in game, may also lower one stat whilst boosting another, so be warned. Other than appealing to your own personal preferences, these stats will affect you more as your Monster grows. During adulthood, your monster also gains the ability to earn respect through their actions. While not immediately useful, respect becomes extremely important in the later game. 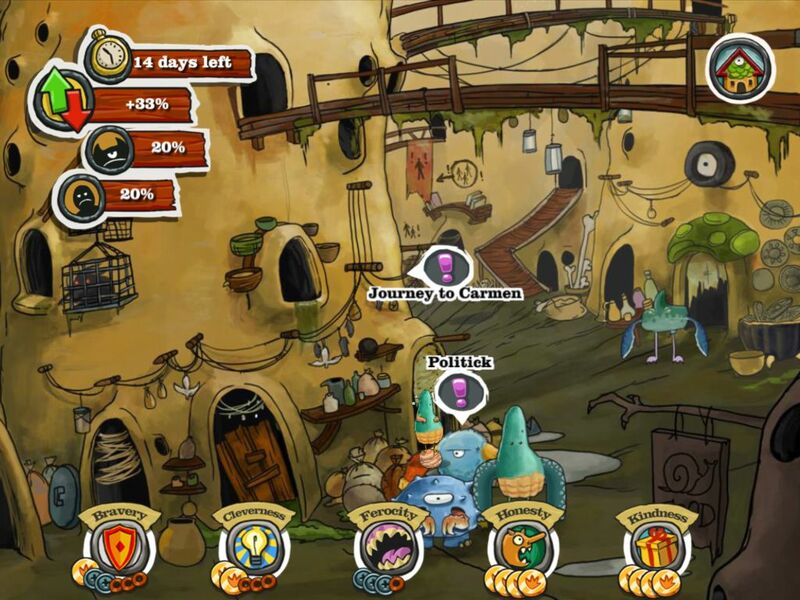 Each tier of life is also met with a turn limit, preventing you from completing every available mission. So choose wisely. At the end of adulthood you will be faced with a choice beyond your control. When a monster reaches a certain age they are faced with two options. Dissolution or Ascendance. Those who have lived a metered and mediocre life will be dissolved into the slime vat in which they were born, becoming the building blocks of new life, permeating their knowledge throughout the next generation. However, those who have made a mark on the world and gained respect, will become an Elder, one who shapes the world. Naturally, if you did not manage to gain enough respect from your fellow creatures, your game will end as you dissolve into the primordial ooze. Or, in the much more beneficial option, if you have you will advance to the next stage of life. 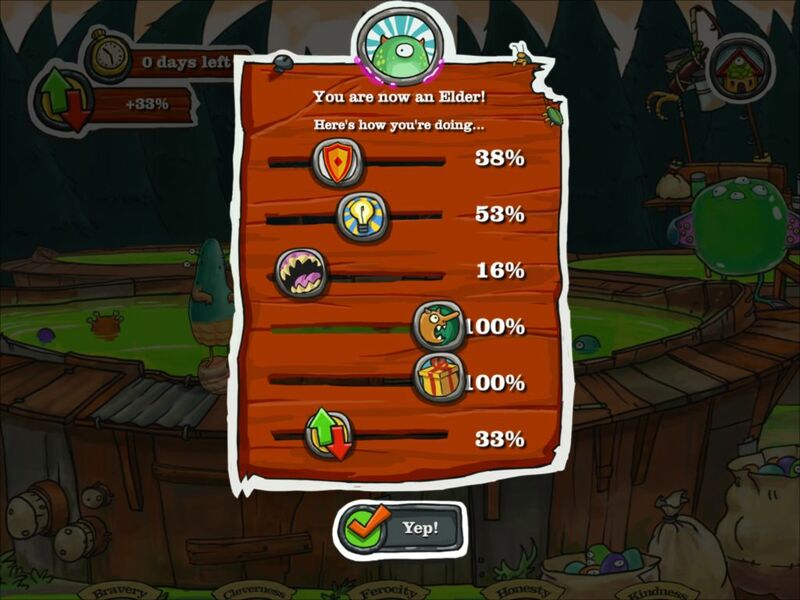 As and Elder, two more bars are added to your HUD, expressing the attitude of humans towards monsters and vice versa. Cough *these are important* Cough. Missions now include options that possess statistical requirements, lending to your evolved traits. Though you may choose any option, the higher your stat is, the greater the chance of success is. So play to your strengths and strive for the best result possible. 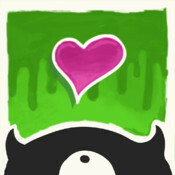 As can be expected from the premise of the game, Monster Loves You! features a quirky art style. The monsters are cute, crazy, with just a touch of evil…ok maybe a lot, it really depends on the monster. As your Monster friend grow throughout the game, you can quite clearly notice their metamorphosis as they shift from Morsel to, hopefully, Elder. 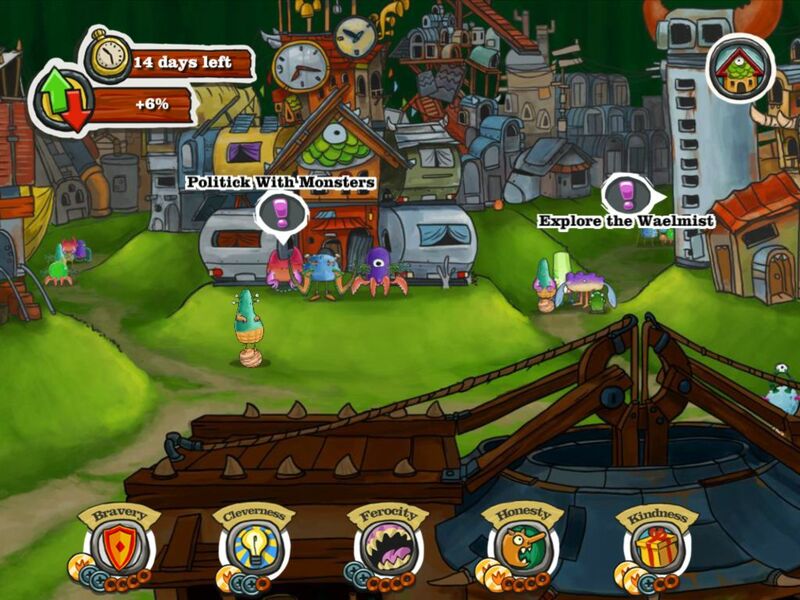 With each passing stage, you are also rewarded with some new locations for your monster to dwell. These are fairly varied in design, from slime vat to quaint house, providing some nice visuals as you progress. This being said, you don’t get the chance to fully appreciate the view due to the ongoing text adventure. 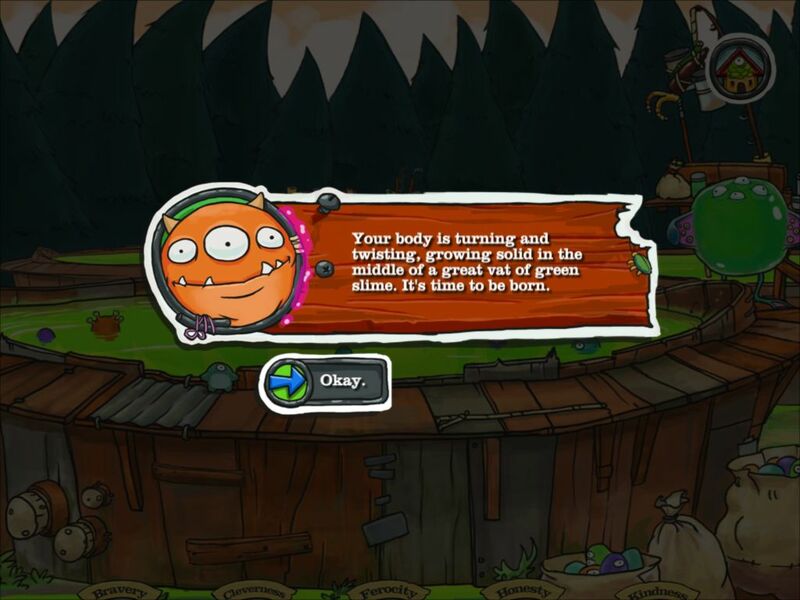 With each conversation and decision list, the images are covered by text for a majority of the game. Though the dialogue is topped with a monster who expresses emotion appropriate to the situation, it is not neccessarilly your Monster, which sort of takes away from the whole “personalised adventure” notion of the game…though it is awfully cute sometimes. The audio, much like the visuals, is somewhat odd. The audio of the game is rather upbeat and calm, just what you’d expect in a world of monsters. Built around the constant presence of an acoustic guitar, a medley of chimes, whistles and harmonious vocals create a surprisingly beautiful and catchy tune. The audio does a great job of supporting the style of the game, presenting a strange world that’s not too heavy on the seriousness, despite all that occurrs within. They’re monsters after all, this is their normal life. Monster Loves You! is an interesting game. Amidst all the cuteness and oddity of the monster world, the life you create for your Monster is surprisingly intense. From before even birth, you are presented with the strong desire to matter. To be something. Philosophical questions of self worth and free will permeate through…a little slime ball. The overall style is quite contrary to the deeper nature of the game, should you choose to look into it that much. If not, it’s a strange little game about the little monster who could, would and did. Have fun, go wild. Be brash, be calm, be a neurosurgeon if you want. It is your choice after all.